Have you ever heard of a tongue scraper? When I first saw a friend using one, I had no idea why anyone would want to scrape their tongue every day when they wake up. Now, after years of using one, I use one every day, and miss it terribly when I don’t have it. A tongue scraper (also called a tongue cleaner or tongue brush) is an oral hygiene device designed to clean off bacteria, food debris, fungi, and dead cells from the surface of your tongue. The film that develops on your tongue while you sleep is a good indicator of what’s going on inside your body. It can be clear, thick, white, yellow, brown, or even green. The bacteria and fungi on the tongue are related to many common oral care and general health problems and can be a leading cause of bad breath for many. Tongue cleaning has been around since ancient times in India. Ayurveda, the Traditional Indian Science of Medicine, recommends cleaning the tongue as part of your daily self-care regime to remove ama, toxic debris that builds up in the body. During sleep when the body is resting, the digestive system works to detoxify itself. These toxins are deposited on the surface of the tongue via the internal excretory channels, and are responsible for the coating usually seen on the tongue first thing in the morning. Tongue scraping has found it’s way into Western society as folks discover the benefits of cleaning the tongue every day. THIS is the tongue scraper that I use. Removing the bacteria, food debris, fungi, and dead cells from the tongue significantly reduces the odor from the mouth. You may have been told to use your toothbrush for this purpose, but brushing the tongue does NOT efficiently remove all of the film that develops on the tongue. You will be blown away the first time you do this by the amount of gunk that comes off of the tongue. Removing build-up from the surface of your tongue will better expose your taste buds. This will lead to better enjoyment of the flavors of your food. Ayurveda teaches that the better we enjoy and savor our food, the better our bodies digest and assimilate, leading to better over all health. Also, Ayurveda teaches that blocked taste buds and tongue receptors interferes with our body’s ability to communicate with our brain about what types of foods we need to maintain our health, leading to false cravings. As you sleep, your body is detoxifying. Much of the film on your tongue is toxins excreted from your body. You don’t want to re-ingest that do you? NO! Scraping your tongue first thing in the morning will remove this sludge from your tongue and from your body, improving your over all health and improving your immune system. By removing bacteria and toxins, you are also contributing to better dental health as well, leading to healthier teeth and gums. The bacteria that you remove from your tongue are responsible for things like periodontal problems, plaque build-up, tooth decay, gum infections, gum recession, and even loss of teeth. Did you know your tongue is a mirror reflection of your internal organs? 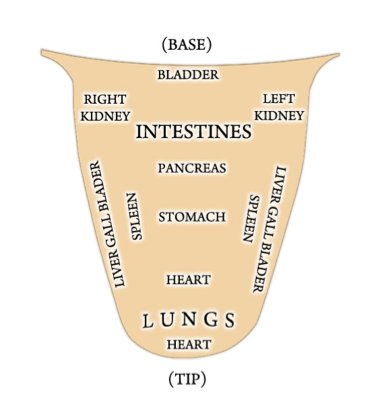 Just like with hand or foot mapping, the tongue is mapped out to reflect various parts of your internal body. You can learn so much about what is going on in particular areas just by looking at your tongue every morning. Also, by scraping your tongue, you are actually stimulating and massaging those corresponding internal organs, just like in acupressure or acupuncture. Pretty cool, huh? Tongue scraping should be done on a regular basis, preferably in the morning. It involves using a long, thin, flat piece of metal (sometimes plastic), which is bent in the shape of a ‘U’, to scrape the surface of your tongue. To do this, extend the tongue and place the scraper as far back on the tongue as is comfortable. Gently scrape from the back or base of the tongue using one long stroke, until you have scraped the whole surface. Rinse the scraper and begin again. Scrape firmly, but gently. Do this until the tongue feels clean and is free of coating. Wash the scraper well after each use with hot water. When you first get started scraping your tongue, be extra gentle. Your tongue will get used to it quickly. You will be amazed at how much stuff comes off of your tongue in the morning!! Many health food store sell tongue scrapers. You can also buy them online. They are inexpensive, and there are a few different kinds out on the market. I prefer the ones made from stainless steel because they are easier to clean. The two that I like are HERE and HERE . Another great practice to get into is oil pulling. Have you heard of it? Check out this posts if you are curious : What is Oil Pulling? and Does Oil Pulling Work? Great info! It’s very interesting to me as I’ve been considering this lately. I usually brush my tongue but I didn’t realize it wasn’t as effective. It’s also nice to see the scrapers are so inexpensive! yes, I have been discouraged from brushing my tongue by my Ayurvedic teacher. Says it not only isn’t as effective but can be too abrasive on the surface of the tongue. I love my scraper. Paid about $3 for it. Typo. You have “5 reason”, but it should be “5 reasonS”. OMG!!! Thanks for the laugh. I have looked at that image a 100 times and not noticed it. I guess having someone else edit my stuff could be helpful. The brain sees what it wants to see. FIXED!!! I oil pull everymorning and right after that I use my tongue scrapper.. Nice!! I try to do it every morning as well. How do you clean the tongue cleaner? When you use soap and hot water do you soak the scraper in water? After using one for so many years, I can’t imagine not using it. My tongue would feel so unclean without it. I love my scraper! I’m always surprised that more people don’t use it. I’ve been using a tongue scrapper for a few years now, and love it. The best thing is I noticed a big change in the “crud” that comes off my tongue since I’ve been eating “Clean”. There’s a lot less icky stuff on it. I would not give it up. I agree! I can’t imagine NOT using it! Thanks for the tips! I recently started using a tongue scraper and my mouth feels so much more healthier when I use it. It is amazing how something so simple can do so much for the health of your mouth. Thanks so much for the great blog and linking to our page! We’re thrilled that your a fan. 🙂 Once you start tongue scraping, it’s really hard to stop! Ive always just brushed my teeth but never gave scraping my tongue a second thought. I’m going to have to try doing this. But how in the world do you get your gag reflex to not kick in while your scraping your tongue? Mine seems to not take much before it kicks in. Great article and it was a lot of food for thought. Question: I started scaping a few weeks ago with a copper scraper. I now have like a burning or metal sensation in my mouth mostly on my tongue area. Is this normal? Am I scaping too hard, too often. I have been doing it each morning. Any ideas? Hmmmm…. sounds like you may be scraping a little too hard. Or the copper scraper is affecting your tongue. I have only used stainless steel.